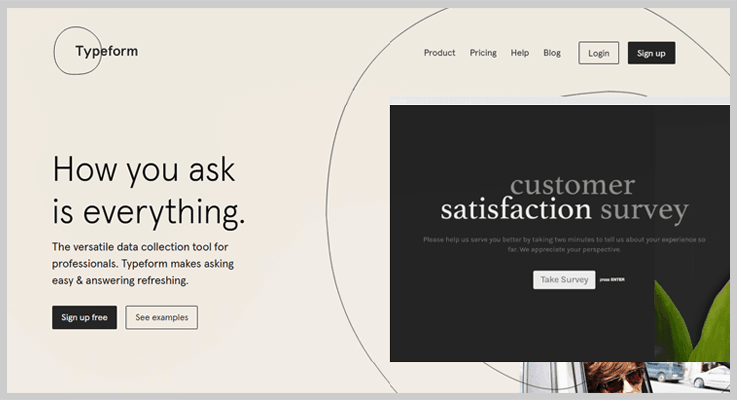 Forms are the best way to collect user views, gather feedback, suggestions, and queries. Normal forms can be boring – but that doesn’t have to be. Make them look attractive and amazing by applying some kind of automated designing on them. And for that, you surely need a proficient form automation software that will make your forms visually more appealing and would hike up your business. So here we have compiled up the ultimate 6 form automation software for you. Before going in deep of these form automation services have a quick view at the comparison table of 5 amazing form maker software. These automation software will help you in adding a different kind of styles like background colors, images, prebuilt themes and more on the various form whether it’s a simple form or payment form and others. In addition, all the services present in this article are easy to use, have the ability to customize and can integrate with other email marketing software and payment gateways as well. Further, these form automation software are filled features with rich like you can create multiple forms, collect online payments, drag and drop form builder, and much more. Isn’t all of that interesting! Then what are you waiting for let’s dive into the detailed description of the forms automation software and pick the best which will fulfill your requirements. FormGet is an extremely simple and efficient software. This software is used all around the globe in multiple languages as its a multilingual one. The best part of the FormGet is that you can create all kind of forms whether its a lead generation form or payment form or any other kind of. It allows you to manage unlimited form on a single dashboard with different specification. Also, it helps you to connect forms with email marketing applications like MailGet, iContact etc. FormGet consists of four plans which are briefly discussed below. Starters Plan – It’s a basic plan which includes 3 Google analytics account integration, 20MB files upload service and 6months upload storage for $5/m & $50/y. Rookie Plan – The rookie plan has 260+ ready templates, custom email notifications, and RTL services add-ons for $35/m & $350/y. Pro Plan – Pro is very popular pricing plan of FormGet. It contains priority support, agent/client dashboard and data security for $79/m & $790/y. Advance Plan – Advance Plan provides you with unlimited users, third-party integration and email attachments for $99/m & $990/y. You can use its drag and drop option to create a form within a few clicks by dragging the details like name, email address, contact number etc. Also, adjust them according to form requirements. This software allows you to customize each and every area of the form with the background color, font sizes whether its header or footer section. FormGet helps you to instantly embed forms with sliding widgets on the website and you can even share them on the social sites like Facebook, Twitter etc. It’s superior in collecting the one-time and recurring online payments through PayPal and Stripe processing software. Pabbly is a modern digital form builder software which assists you to create multiple beautiful and elegant forms within a few clicks. It provides you with drag and drop form builder option through which you can easily create forms. This software benefits you to create unlimited invoices with the help of custom branding feature. So, you can add up your logo, your business image, custom message etc on the forms or your created invoices. By using its custom designing feature you can style the forms in different layouts or can add your own designs to them. Pabbly form maker software contains a different kind of pricing. Starter Plan – This plan will cost you $5/m with 1 user, 1200 form submissions and you can also embed 10 domains. Rookie Plan – It will cost you $35/m with 5 users, 25k form submissions and you can embed 35 domains. Pro Plan – It is very popular among the all as it just cost you $79/m with 10 users, 60k form submissions and allows you to embed 75 domains. Advance Plan – This plan will cost you $99/m with all the services like unlimited users, emend unlimited domains and custom email notifications. You can create unlimited forms by using its prebuild templates on the software. 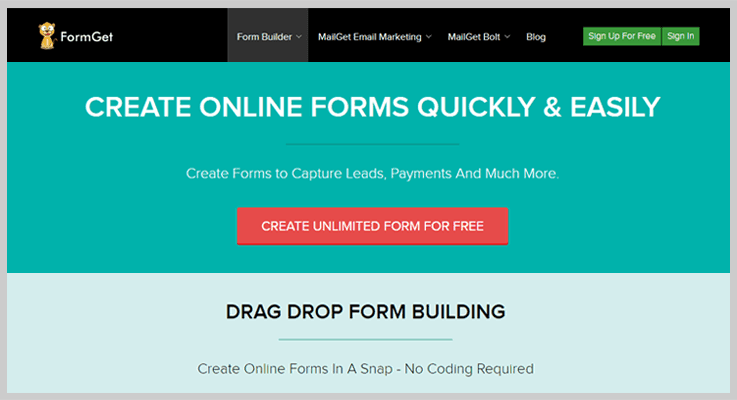 As its ready to use form templates that help you create forms instantly. This software provides you with API frameworks which you can easily integrate into apps or websites. And through which you can easily manage the billing details. Allow your team members to access the details of the form and they can also add or remove the options on form and can create new ones. Also, you will be regularly updated with email notifications whenever a user submits the forms. By using AbcSubmit you have the flexibility to create online forms starting from the simple contact form to complex and highly customized forms, resize every element in your form and the form itself, create your own theme or create a template to use it on every form if you want so. Whether you use AbcSubmit for publishing a form on your website or create a website with a form using our builder, you have unlimited variants to place your fields using drag and drop and our resizing mechanism. Right from the free plan you can use our fields to see how your forms will appear for your clients and change every aspect of your forms. We offer a 14-days free trial for each of our plans and a free plan for basic usage of our editor. Our price ranging from $9.99 to $99.99 per month. More info are available on our pricing page. In minutes you can sell items online, create product catalog, add shopping cart, accept payments, collect data, create reports, online schedule and more, all from a single place. With recaptcha, data encryption and AI security solutions, all starting from free plan, your forms and submissions are protected from bad reputation networks, VPN, proxies, spam, and internet fraud. For those who want their own domain or subdomain on a form, we covered that too, just hit publish and you can manage domains or publish your embed code anywhere you want. 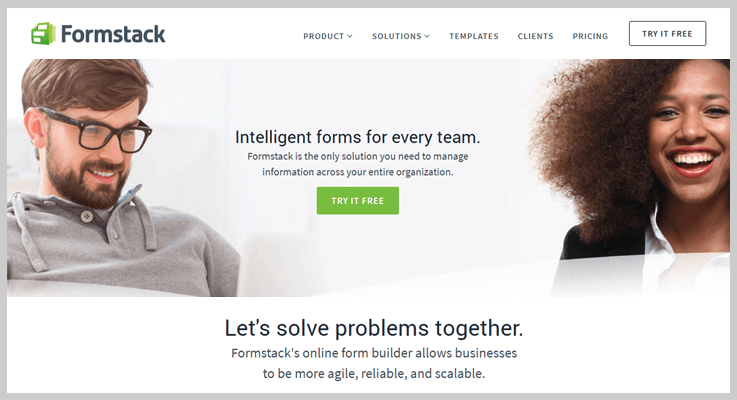 FormStack is the best form builder software that helps you to easily generate and customize the layout of numerous forms. It allows you to connect your form with more than 40+ apps, APIs, and webhooks online. You can use its prebuilt forms layout designs which are fully customizable to save your time and also you can import your own form designs. FormStack offers you four pricing plans with monthly and yearly cost. Platinum Plan – This includes each and every service of the software like approvals, custom submission messages etc with cost $207.50/mand $249/y. Gold Plan – It also includes all the services except ‘Salesforce Integration’ costs you $82.50/m and $99/y. Silver Plan – This plan includes only five of the services like custom submission messages, mobile-friendly forms for $32.50/m and $39/y. Bronze Plan – It has only two of the services base features and mobile-friendly forms which cost $19/m and $19/y. You can exclusively addon other fields like portals, workflow and conversion kit for collecting the data more systematically. Conditional logic functionality eases your user to easily get in touch with the particular section of the forms it helps you to automatically show/hide the questions and increase the success rate of the website. Activate the best source for collecting & accepting single, multi and subscription-based payments through PayPal. Also, it allows you to create subdomains of your own business brand by customizing the URL. 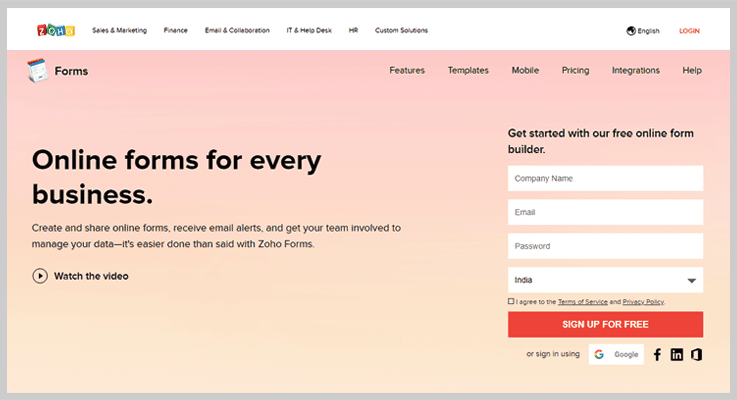 Zoho is an amazing and classy way of developing and sharing a form as it provides service of email updates, involves the whole team to get manage data. This allows you to choose numerous filed types while creating a form like a name, dropdown, decision box, date-time, image choices, checkbox etc. You will be benefited with 30+ filed types, customizable themes, and templates which helps you to create any kind of form. Also, it allows you to create custom reports and identify the traffic source engine for forms. You can switch to both monthly and yearly pricing plans of Zoho. Basic plan – It includes 1 user, unlimited forms, and 10,000 submissions for $8/m and $10/y. Standard Plan – This has 10 users, approval and tasks for $20/m and $25/y. Professional Plan – It contains 25 users, 5GB storage and unlimited forms for $40/m and $50/y. Premium Plan – This plan has 100users, 150,000 submissions and custom themes for $80/m and $100/y. This form animation software is powerful as it allows quickly to transit the payments, performs arithmetic logic calculations, create PDF’s files of forms very quickly. You can embed different forms on your web pages, share them on social media platforms and even by using QR code promote them offline. It allows you to configure the email notification option for forms so that as soon as the checkout is done a confirmation email is being sent to the respondents automatically. Figure out each and every error or conversion rate and view statistics of the forms within a single minute. And keep tracking the performance even if you are away from the desk. TypeForm an awesome online form builder tool with which you can beautifully design forms for your brand website. This software allows you to add questions pop with images, gifs, and videos on the form. You can easily review each and every change you activate on form through the live preview. This comes with three different monthly pricing plans. Basic Plan – This has 100 responses and 100 type forms to get a better answer online and it costs you $0, free of cost. Pro Plan – It contains unlimited responses and fields for single user and costs you $30/m. Pro+ Plan – This includes advanced features for branding with unlimited responses and & fields for more than one use and it costs you $59/m. You can include some kind of online quizzes and check out games for users on the forms. This software helps you to ask your respondent to add any kind of media files on the forms. Collect all your online payments very easily through Stripe payment gateway. Also, it respond back to your customers through emails confirmations automatically. K2 Forms automation software is faster as well an easier way to create a different kind of forms. It has an advanced technology software “stack” which helps you to generate the forms just in a single click. This benefits you with its reusability functionality which is termed as a “smart form” that acts as building blocks to create more forms. You can import the data from your existing platforms and it will provide you with forms. Starter Plan – This plan provides $12 per user, 5 workflows and up to 25 forms. Builder Plan – It includes $18 per user, 25 workflows and up to125 forms. Premier Plan – The premier plan includes $24 per user, 125 workflows, and up to 600 forms. Enterprise Plan – It has $31 per user, 1000 workflow and up to 5000 forms. You can use its electronic signature function on the form and collects online approvals for contracts or employee onboardings. 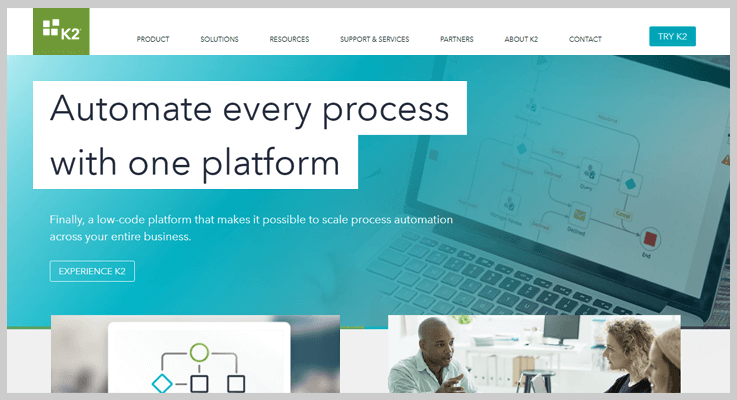 As K2 forms is the “smart form” software so, you can embed the forms anywhere on the web pages or to the third partylike Salesforce, SharePoint etc. Its drag and drop functionality allows you to drag the details like a name, contact number, e-mail etc on the forms from the inbuilt form templates. Conditional logic allows you to easily review the complex form in an easy way and maintain the credentials for forms like a show or hide certain fields or pages etc. 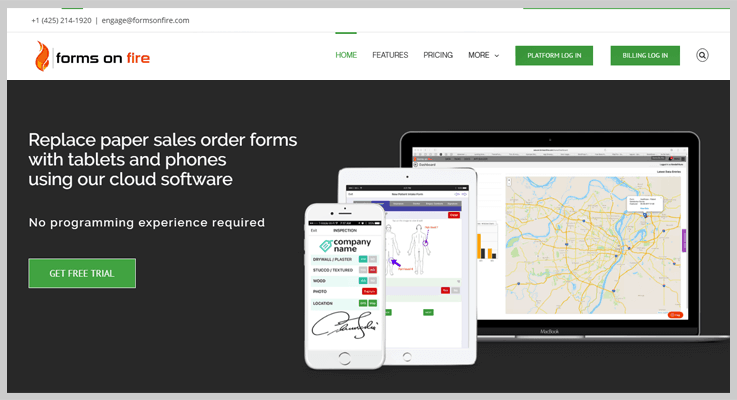 This is an amazing online form automation tool which allows you to replace any paper audit or work order forms with tablet and mobile phones using its cloud software. With its mobile app build an on-the-go data collection for forms. Its available for Android, iOS, and windows. All the high rated companies rely on its quality as all the elements of the forms can be customized easily like logos, colors, forms, and connections. In fact, it has an advanced feature list that includes data source, filtering. formulas and dynamic answers. Forms On Fire comes up with two different yearly pricing plans. Standard Edition plan will cost you $240 with 1,500 Submissions Per Month, standard screen types and standard connectors. Premium Edition plan will cost you $300 with unlimited submissions per month, all screen types, workflow and document management service. This software allows you to collect all the data of forms and arrange them in a systematic manner as well as you can also analyze the data on specific points. Everything that you are featuring in while building a form like data sources, documents and tasks can be taken offline without any hassle as it also works in the offline mode. You can use its inbuild productivity applications: Microsoft Word & Excel to create fully customizable designs that are beautiful and versatile. And further it addon other documents types like .csv document, .txt documents etc. It allows you to summarize the data count of forms and display them on the device. Above we have discussed the ultimate form automation software. All of them are fully featured rich and doesn’t burden your budget. Now, it’s your turn to handpick the best one for your brand website. If you have any query or suggestion please comment below.